About a week ago, a fellow Lumberjock (Loren) directed me to a handmade bowsaw available on Ebay Stores. I ordered the 14” maple variety for $62.00 including shipping, which I thought was quite reasonable. It arrived well-package, disassembled in a long shipping tube, and came with detailed re-assembly instructions. I found the unfinished bow to be of excellent craftsmanship and the pieces fit with high tolerance. It is an absolute pleasure to use and I recommend it highly. Thank you for a good review. I think of a bow saw for cutting off tree branches. Do you use it for other applications? Does it serve any “in the shop” purpose? 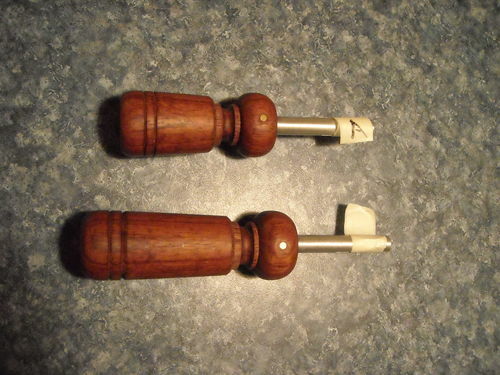 I had found these saws on Ebay a few weeks ago and had been thinking about getting one. I’m curious to see what you think about it after you’ve had a chance to use it. Thank you gentlemen! 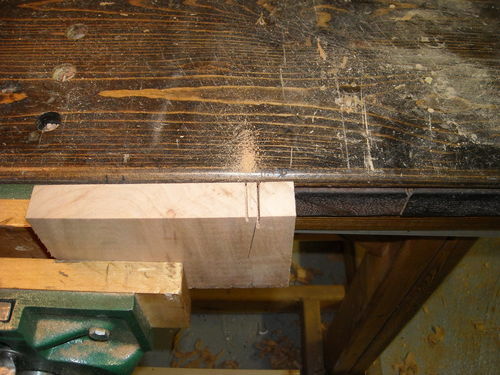 To Rich, many of the older craftsmen seem to use bowsaws for cutting dovetails. You’re able to pitch the blade & cut angles whilst maintaining a vertical orientation on the saw. I gave it a try last night & it’s definitely will take some getting used to (compared to my Dozuki, at least). To Cessna, I’ll list the blade details below. It looks like a VERY fat Nomex bandsaw blade that’s been cut down & braized. It came in it’s own manufacturer’s packaging. To Derek, I played with it just a bit last night but it seems to cut remarkably well into endgrain. I only made a couple quick passes because I was anxious to get to my nightstand. The cut on the right was my attempt with the blade pitched. These cuts represent about 3 passes. The kerf is quite thin. 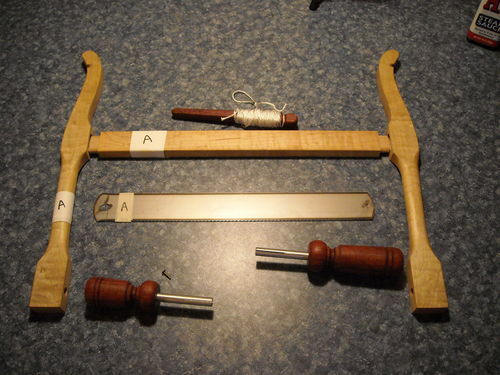 New Handcrafted 14” Woodworkers Bow/Frame Saw, European Style. 15” Tall and Blade is 14” Long, 18(TPI) teeth per inch Rip blade which is a finer blade than the 9TPI we offer on the 18” Bow/frame saw. Approx. : weight 2 1/2 Lbs. Solid Premium Figured Maple frame with Solid Bubinga handles and Solid Bubinga toggle. Blade is easily removed for sharpening. Blade tension provided by a toggle and sail makers cord. Blade rotates for proper orientation to work left or right handed. Handmade and shaped for comfortable use. Inspired by a nineteenth century antique saw. At one time Saws like this could be found in every woodworkers shop. Today the originals are highly collectible and new Bow Saws are of marginal quality-if you could find one. I have built and used Saws like this in my own shop for many years. Though this Saw is Ideal for Dovetailing and Light Tennoning, I use this Saw Primarily for cutting Dovetails. It is intended for finer, lighter duty work than our 18” Bow Saw. A few turns of the turnbuckle brings the blade to tension and you’re ready to cut (It is always a good practice to release tension on the blade when finished cutting). Unplug your shop this is a beautiful tool and wonderful to use! Due to many requests, in addition to the standard Saw Blade, we can now offer a 3/8” Scroll Blade for an additional $14.99. If you would like to take advantage of this offer, just add an additional $14.99 to your payment at checkout or contact us and we will add it to the invoice for you. We also can offer you a extra 9TPI Blade for this Saw for $17.99 or an additional 18TPI Blade for an additional $19.99. Just let us know or add the price to your invoice. . Please note: Free Shipping offer is only valid within the United States all others are calculated. I made a 24” bow saw a couple of years ago and found blades difficult to find. Highland in Atlanta ended up being the best supplier. The blade teeth were stamped and had to be sharpened and set to work well. 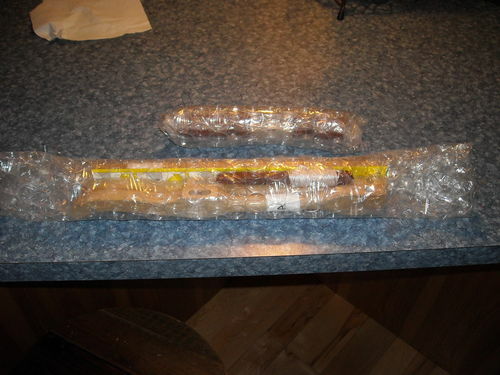 I use mine for any long stock and keep it in the car. Cuts very smooth. Rich, when I was a kid in France (do not say a long time ago) the bow saw was the only thing we ever used. We also had saws like what you would call western saws but the bow saw was the tool of choice for the real professional. Thanks Bertha, I believe that I will order one of those. I had one years (more years than I care to remember) ago with a scroll blade on it and it was just learning how to be of use to me when it up and grew legs and wandered off never to be seen again. Do they have any other types of blades available for this saw. I have seen these types of saws used for everything from crosscutting a board to length, some resaw operations, but with a narrow blade, you can also do pretty effective scrolling work with this type of saw. Beautiful saw. I have never seeing anyone in person or video use one to cut curves on furniture. Yes, I am very curious about that and wonder if any of the hand-tools-ony or -mostly guys have posted videos, etc on the web. Looks like another tool to add to the wishlist. As I wrote above, not so long ago about 50 years (I know that for some of you this is longer than you have been alive) these kind of saws where the saws of choice for the real craftsman in France. They came in all kind of size ( some huge to rip long and wide boards) and with all kind of blades according the the work to be performed. We had “scies a chantourner” which came with a very thin/narrow blades (between 1/8 and 1/4 wide) to cut contours. Thank you, Bert! Those are several uses I had not considered. 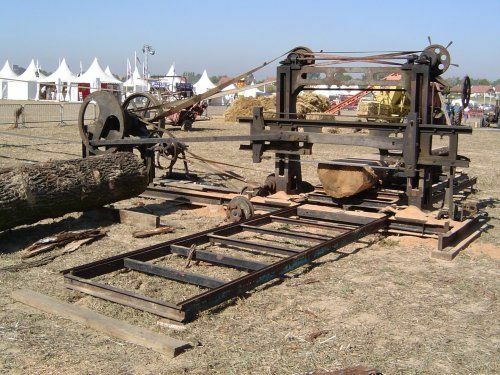 Looking for more pictures of saws, I found this picture which is not directly related with our discussion but i had sawmill in France very similar to this one (and after all the saw itself is a very large bow saw). This one is powered by a horse which was the case with mine but then the horse was replaced by a steam engine. When I got mine the steam engine was fortunately gone and I then installed an electric motor. This saw was slow but the quality if the cut was excellent. My father , with out my agreement sold it.! I’m glad you got you one Al. I’m going to a carving guild meeting tomorrow and have been sitting on my funds to see what I can find. But I will get one. Very helpful review. Thanks! Thanks to all above. I appreciate the history and use of the saw a bit more now. Dennis is right that they pack down very small. When it arrived, I was trying to figure out what I possibly could have ordered that would arrive in a shipping tube! I hope to report back later after I’ve had some time with the saw.